Back by popular demand and in its sixth anticipated installation, Mikuni once again heralds the arrival of the time-honoured Japanese tradition that takes place during the first light of Spring, Hina matsuri (also known as Doll's Festival or Girl's Day) which marks a day when families wish their daughters success and happiness in life. 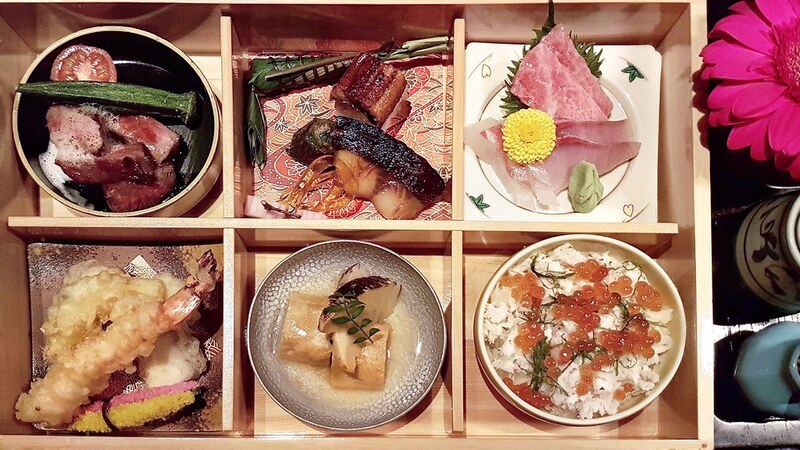 Helming the Japanese restaurant is Chef Keisuke Uno, who have specially curated a delicately refreshing bento that is themed for the season - an embodiment of refined feminine grace to reflect the coming of age. From 1 to 10 March, diners get to indulge in a multi-sensory culinary experience with nine elegantly curated dishes aptly adorned with pink and floral garnishes in a dainty wooden lacquered bento box, thoughtfully designed to please and pamper palates. 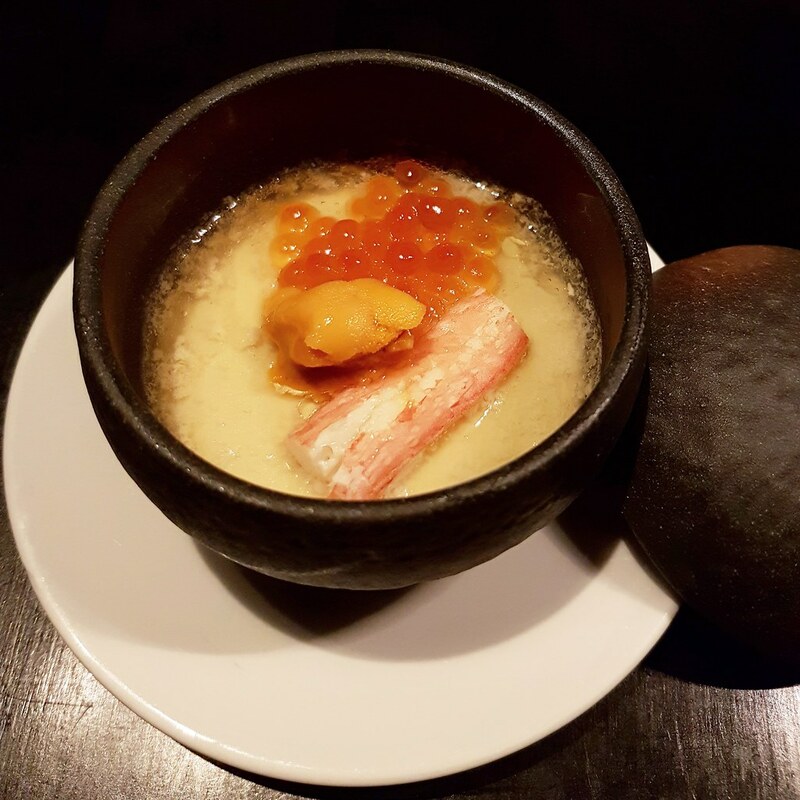 The luxurious 9-course bento comes with a rich starter of Foie Gras Chawanmushi with Hokkaido Seafood. It boosts a remarkably silky and delicate texture, while its flavour is given a premium upgrade with a strong hint of foie gras, as well as an addition of fresh uni and salmon roe. 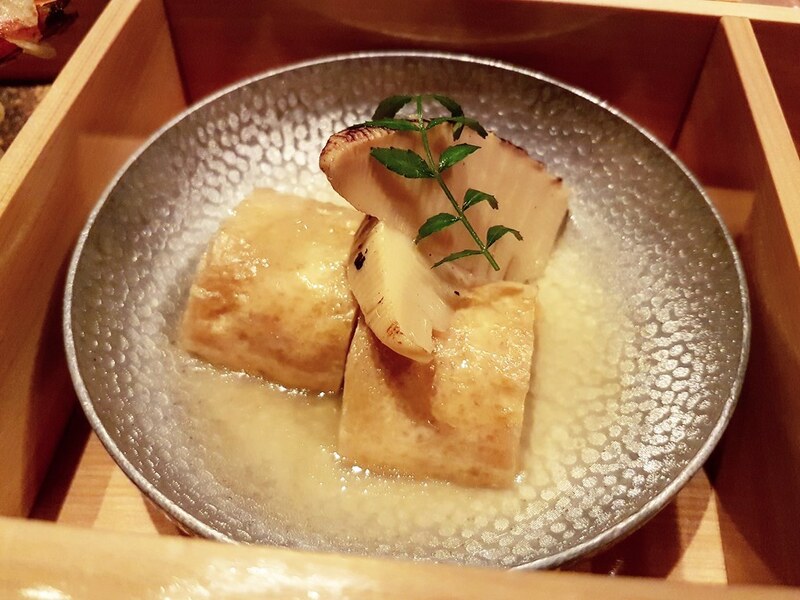 These mouth-popping granules contribute bursts of mildly salty notes to complement the sweetness of the seafood and steamed egg custard, making every bite of the chawanmushi rich, full-bodied and thoroughly enjoyable - A perfect appetizer to kick start the 9-course bento. 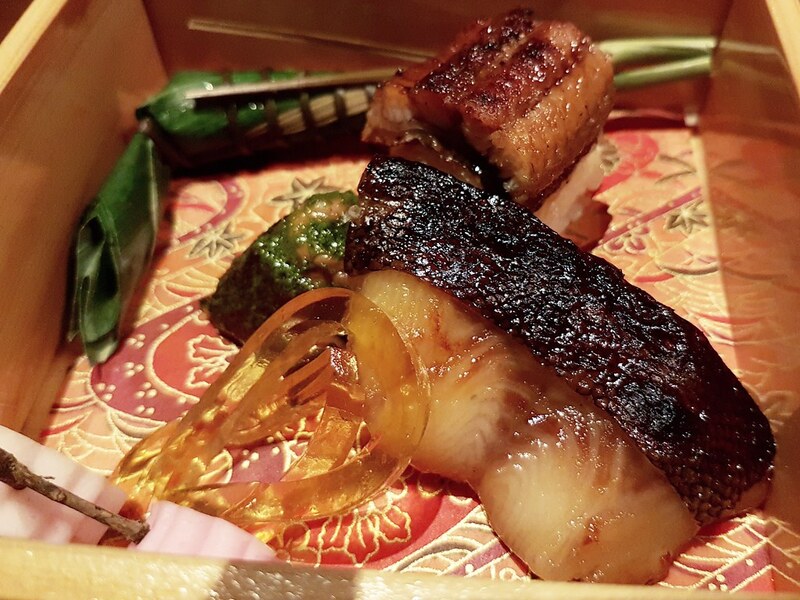 Next on the bento is followed by a marriage of refined flavours including Miso marinated Black Cod, Eel Sushi, Japanese Plum Jelly Sasamaki-fu, and Braised Octopus artfully showcased on a delicate Japanese origami paper. This dish of assorted appetizer delicacies displays a medley of textures of flavours from the tender miso marinated black cod, soft eel on fluffy Japanese rice, juicy brasied octopus and strips of plum jelly with a sweet-sour balance. 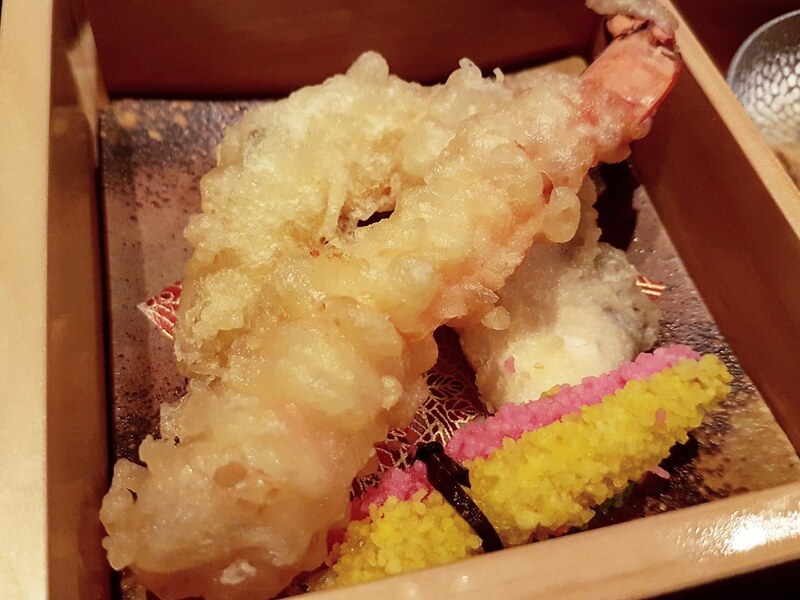 The tempura section includes a platter of 4 assorted items - Prawn, “Tokushima” Baby Sweet Potato, Pumpkin, Shishitou White Fish, each lightly coated and fried to a golden crisp perfection. 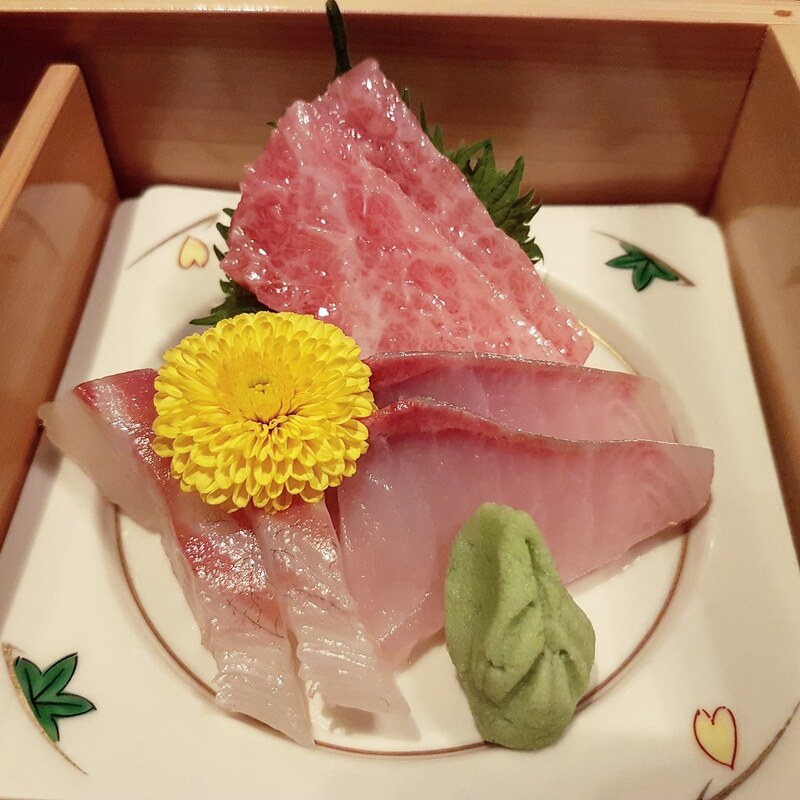 We were presented a variety of fresh, delicate sashimi slices - of Sea Bream, Ohtoro and Kampachi, all freshly from Tsujiki Market. Flawlessly executed, the sashimi slices were fresh with a melt-in-the-mouth consistency. 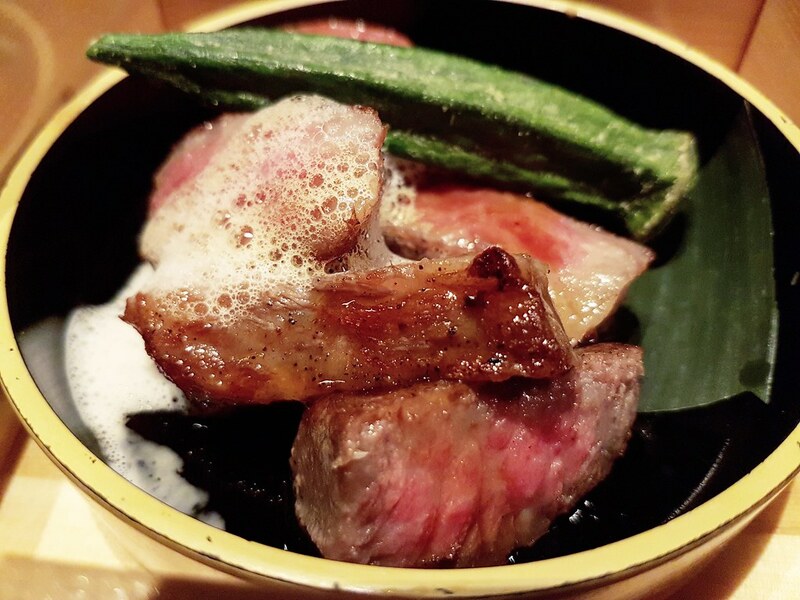 The highlight is the Slow-cooked A5 Miyazaki Wagyu Beef Sirloin which features lightly seared beef served with garlic sweet soy sauce to boost a perfect sweet-savoury balance. Cooked to medium rare, this luxuriously rich and well-marbled beef brings huge satisfaction to every bite with its exquisite quality of the meat - flavourful and tender that literally melts in the mouth. Next on the bento is the Authentic Japanese Braised Bamboo Shoots and Shrimp Cake. The shrimp cake is soft and flavourful, while the braised bamboo shoots delivers a soft crunchiness in its texture with a mildly sweet juiciness to complement the shrimp cake. 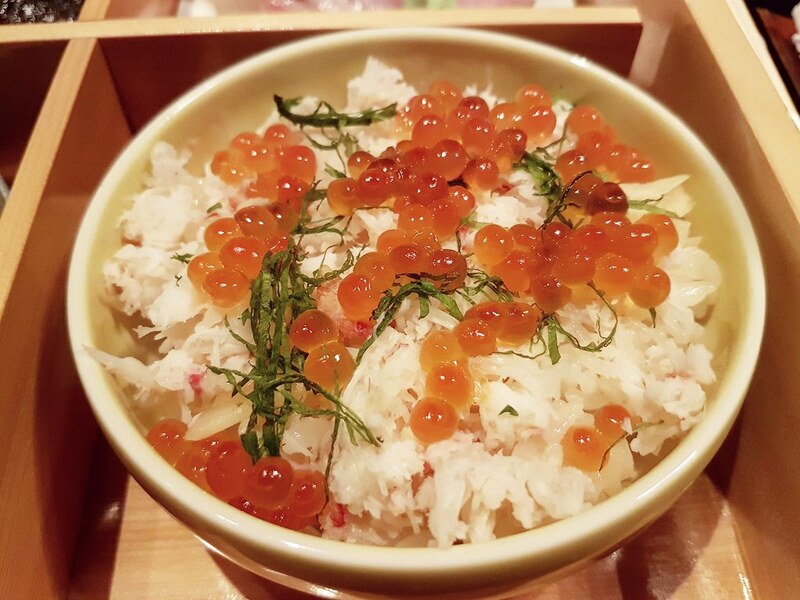 The Crab Chirashi Sushi comes in a bowl of perfectly cooked fluffy Japanese rice filled with generous amounts of soft crab meat within and salmon roe to provide a mild sweet-savoury combination to the dish. Essentially, a dish that seems simple but fare well with its excellent execution. To complement these exquisite dishes, a piping bowl of soothing Japanese Miso Soup is served to cleanse the palate well at the end of the meal. 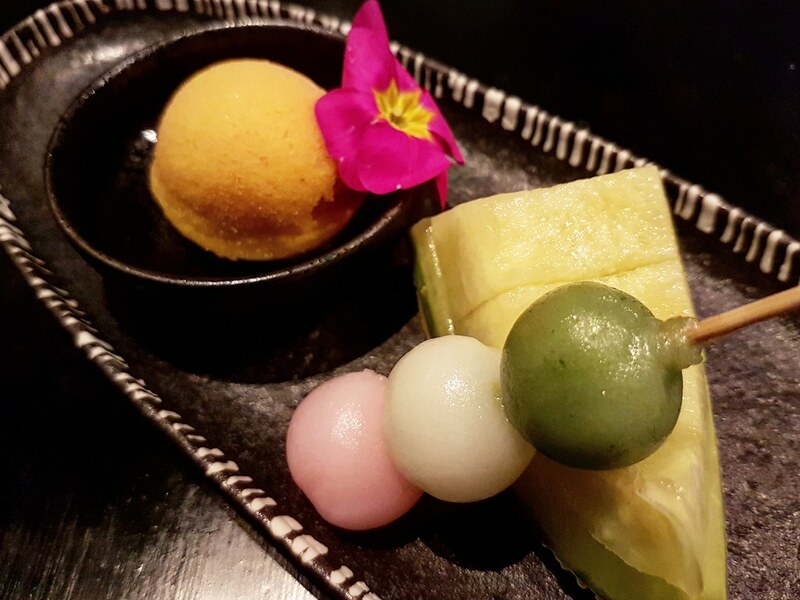 Round off the meal on a sweet note with the Shizuoka Musk Melon and Mango Sorbet, which constitutes Chef Keisuke’s tropical dessert of mango sorbet seamlessly enhanced with the sweetness of shizuoka musk melon. A delectable dessert for those with an insatiable sweet tooth. Kindly note that the Hina Matsuri Bento is available from 1 to 10 March only. The Hina Matsuri bento is priced at $120++ per person, available for lunch.